On my last two trips to our nation's capital, I was introduced to the food of one of this nation's best chefs, Spanish-born Jose Andres. A student of famed experimental chef Ferran Adria of El Bulli, Andres is one of the first to bring the small plate, tapas concept to American dining. 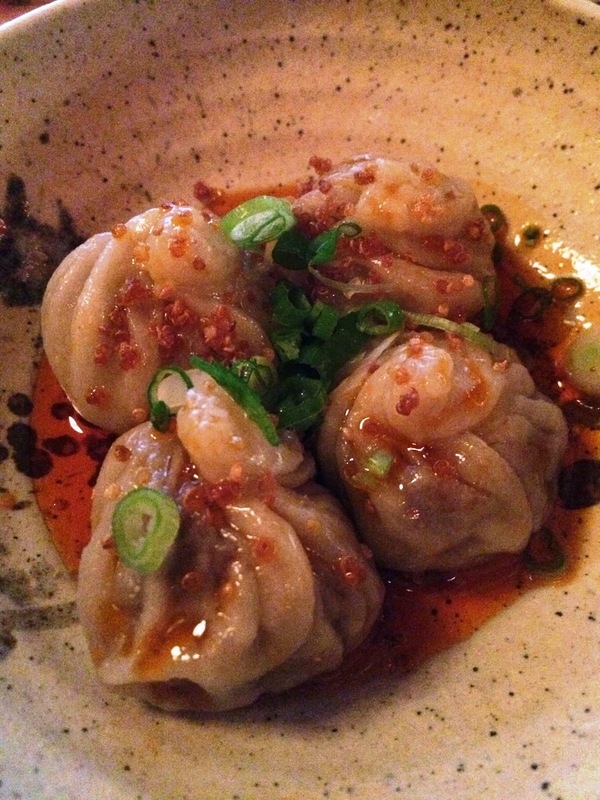 In his restaurant Jaleo, Andres presents traditional tapas in a fun, modern atmosphere. The croquetas are silky smooth and the apple, fennel, and manchego salad with sherry vinegar is refreshing and bright; the lollipop lamb chops are luscious, leaving you wanting more while the ultra traditional tortilla de patas is perfectly constructed, balancing texture and flavor. One of my favorites were the buñuelos de bacalao--salt cod fritters--in a honey alioli. The salty sweet combination with fish at the center was a surprisingly wonderful combination. For dessert, the chilled fruit soup with cheese ice cream is so unexpectedly wonderful that I kept going back, because I could not believe how fabulous the cheese ice cream was. It turns out the recipe is a riff off of the dessert Chef Andres made during "Battle Goat" on Iron Chef America. The fruit soup with chevre ice cream help Andres defeat his good friend and Iron Chef Bobby Flay. As traditional as Jaleo is, Cafe Atlantico is contemporary and experimental; it is here that Andres puts to use all that he learned from Adria. I was there for lunch, and from the first bite I was hooked on the nuevo Latino grub offered by a true master chef. 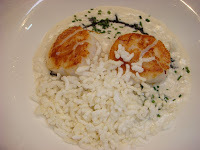 The scallops with coconut rice was a dream, with two perfectly sauteed scallops--the texture was firm without being tough--with a coconut cream drizzled with squid ink and oil. The that alone would have been enough, but Andres was just getting started. The coconut rice was puffed and crisp, with a snap, crackle, pop (trade marked I'm sure) that I have only ever enjoyed in a bowl with milk. It was incredible. I could have ended things there, but why? Andres' answer to the pressed Cuban sandwich is the 'Media dio sandwich' made with pork confit, ham, swiss cheese, pickles, and mustard. 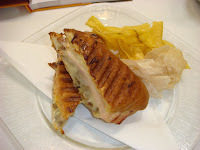 Grilled like a pannini, this is a sandwich bulging with flavor, not the limpid things offered in so many places. Even cold the next day, this sandwich is still better than most The house-made tortilla chips are a nice touch as well. Never eat at a new restaurant with a famous chef and skip dessert. If anything, order dessert first before you fill up on everything else. 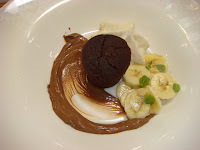 This deconstructed dessert, bizcocho templado de chocolate con banana, as it is officially called on the menu, is a warm cake with Venezuelan chocolate flan, banana foam, and a banana-lime salad with mint. I could have done without the cake itself (it was a little dry from over cooking) and just enjoyed the the rest of the ccomponents by themselves. Next time in DC, I hope to enjoy a seat at the mini-bar, DC's smallest restaurant with only six seats upstairs in Cafe Atlantico, where Andres and his colleagues Katsuya Fukushima and Ruben Garcia create the most amazing delicacies like cotton candy foie gras, olive oil bon bons, conch fritters, and a deconstructed glass of white wine. Few in this country, or the world for that matter, are doing what Andres et al are doing in Penn Quarter, upstairs at Cafe Atlantico. 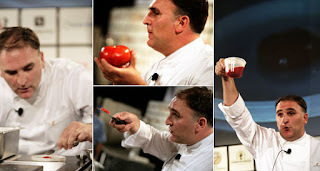 Enjoy the following video of Jose Andres on the Dave Letterman Show and you can catch an episode of Gourmet's "Diary of a Foodie" with Andres here. Then book your trip to visit Washington DC and one of Chef Andres' masterpieces.